Medicaid expansion is expanding profits for a bunch of hospitals. A new analysis of major for-profit health systems found that hospitals in states that expanded Medicaid eligibility under Obamacare are seeing far fewer uninsured patients, a large rise in paying patients and more revenue as a consequence—which stands in stark contrast to hospitals in nonexpansion states. For example, there was about a 47 percent decrease in the rate of admissions of uninsured or self-paying patients at the hospitals in expansion states in the first half of 2014. Yet, hospitals in nonexpansion states either saw a slight reduction in such admissions or no decreases at all, according to the PricewaterhouseCoopers Health Research Institute. The report issued Wednesday, looked at quarterly earnings reports filed by health systems with the Securities and Exchange Commission. Hospitals in expansion states also saw double-digit increases in Medicaid admissions, while Medicaid admissions at hospitals in nonexpansion states were modest, at most, according to the PwC report. As a result, "for-profit health systems, operating more than 500 hospitals in the U.S., report far better financial returns through the first half of the year than expected, owed in large part to expanded Medicaid." The report comes as Medicaid expansion is even being eyed by Republican governors who oppose Obamacare, because of the billions of dollars in federal money that can be untapped for hospitals and other medical providers in states that increase the pool of potential Medicaid recipients. As of now, 24 states do not have Medicaid expansion, although Pennsylvania's plan to expand eligibility in 2015 was approved last week. "In states that have expanded Medicaid, an influx of newly insured patients has helped reverse long-running hospital trends such as declining admissions and a rise in uncompensated care," the report found. "Given the emerging picture of health system haves and have notes, it is understandable why many hospital executives continue to urge state lawmakers to expand Medicaid where they haven't already." The report looked at the five biggest for-profit health systems in the U.S., which operate in 35 states, some of which have expanded Medicaid eligibility to include nearly all poor adults, and some that haven't. The systems were HCA Holdings, LifePoint Hospitals, Tenet Healthcare, Community Health Systems and Universal Health Services. Ceci Connolly, managing director of the Health Research Institute, said the findings were "striking," particularly given the fact that health-care trends normally can take several years or more to become significant. "Even though we expected this sort of distinction between the expansion states and the nonexpansion, we did not expect it to be this significant and this fast," she said. "This one we saw in the first quarter, second quarter, boom, boom boom, and that's pretty striking to us." "For hospitals and those systems that worry about the bottom line every quarter, every year, this is worth paying attention to," she said. Connolly noted that even as hospitals in expansion states are reaping the benefits of treating more people with government-sponsored insurance, hospitals in every state are dealing with a decrease in disproportionate share payments from the federal government. Those payments traditionally were used to offset the costs hospitals incurred from treating the indigent. But Obamacare is reducing those payments by about $17 billion through 2020 because of the ability of states to expand Medicaid, and thereby reduce a hospital's liability to care for the uninsured. To deal with those reduced payments, and to take advantage of Medicaid expansion, hospitals have been reaching out to prospective patients to make them aware how they could obtain health coverage. PwC's report noted that Tenet HealthCare "held more than 350 events to raise awareness of health plans and new Medicaid thresholds," which Tenet CEO Trevor Fetter said lead to "tens of thousands" of new Medicaid enrollees. Tenet, which operates in five Medicaid expansion states, had its uninsured and charity admissions drop 46 percent at the same time that its Medicaid admissions in those states rose nearly 21 percent. "In the second quarter alone, Tenet saw a $78 million reduction in unpaid care," the report said. The difference in the experience of health systems in expansion and nonexpansion states was underscored by HCA Holdings. 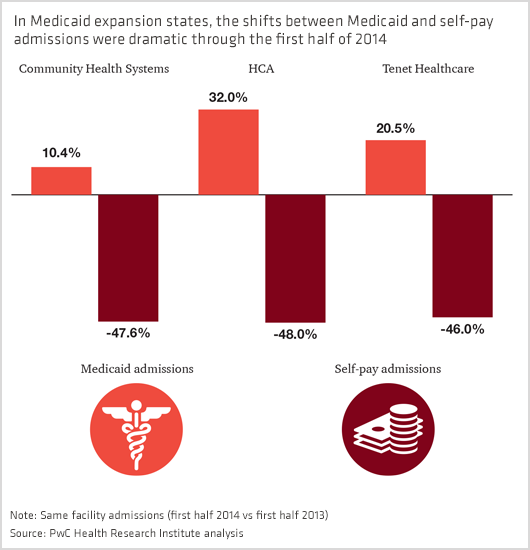 In expansion states, HCA saw a 48 percent plunge in uninsured admissions, and a 32 percent rise in Medicaid admissions. In nonexpansion states, HCA saw just a 2 percent drop in its uninsured admission rate. The positive effect of its business in expansion states was reflected over the summer, when HCA revised its earnings outlook to reflect what it said would be a bigger-than-expected windfall from Medicaid expansion and private insurance plans sold through the health-care exchange. PwC's report found Medicaid expansion has "had a similar effect on doctors," with primary care physicians and others seeing a higher percentage of Medicaid patients in the first quarter of this year than their counterparts in nonexpansion states. The report comes amid continued debate over Medicaid expansion and as 7.2 million people have signed up for Medicaid since last fall. Not all of those newly enrolled were newly eligible, but the expansion of Medicaid and the rollout of the Affordable Care Act have been credited with a big boost in the enrollment rate in expansion states. The ACA originally mandated that every state and the District of Columbia expand their Medicaid programs to cover nearly all adults who earn up to 138 percent of the federal poverty level, or about $16,105 for an individual and $32,913 for a family of four. Traditional Medicaid programs, which are jointly run by state and federal governments, often do not cover adults without children, or cap eligibility for benefits at very low incomes for adults with dependent children. But the 2012 Supreme Court decision that upheld the ACA requirement that nearly all Americans obtain health coverage this year or pay a penalty also found that Medicaid expansion would be decided on a state-by-state basis. So far, Medicaid expansion has been adopted by 26 states and the District of Columbia. Pennsylvania's version of expansion was approved last week, and will begin Jan. 1 Governors of five other states are making moves to expand or are seriously discussing that prospect. Unlike traditional Medicaid, where state and federal governments split the costs, the federal government is footing 100 percent of the costs of covering the newly eligible under Medicaid expansion through 2016. After that, the federal government's share of the costs will decrease gradually, but are set to level out at 90 percent—much higher than its share under traditional Medicaid in any state. Aaron Albright, a spokesman for the Centers of Medicare and Medicaid Services, said, "Medicaid expansion is helping millions of Americans access health coverage, many for the very first time. Increased coverage reduces hospitals' uncompensated care and lowers cost shifting to businesses and everyday Americans that see higher health insurance premiums when those costs are passed on to them."